This was my third running race of the season, but I’m still just thinking of races as events this season. Despite the fact that I’ve been called a sandbagger for saying I’m not really racing yet, that’s how I feel. Sure, I’m running as hard as I can for the amount of training I’ve done so far, but I don’t have any kind of extra gear/finishing kick, and I’m not strong on the hills at all yet. My early goals this year have just been to have good runs and stay injury-free and, as I’m meeting those easily so far, I’m at the point where a dose of harder training discipline is now in order. I started with what has become my standard pre-run/bike breakfast. Basically, if I have a good size serving of yogurt, fruit and granola with a small orange juice at least two hours pre-run, I never run into gastro problems and always feel like I’m starting well fuelled. The weather for Alice Lake wasn’t nearly as nice as it had been for Golden Ears a few weeks earlier. When I got up yesterday the forecast for Vancouver was mixed, while it was calling for rain in Squamish. As such, I didn’t know what to pack, so my shorts and post-run change of clothes was accompanied by four possible race shirt combos. As it felt very cool at the car up in Squamish, I opted to use a long-sleeve compression liner and t-shirt. I turned out to be too much as I was a touch warm and pretty sweaty throughout the race. Connie and I headed out the door around 7:45am and got up to the parking lot at the 99 highway and the turnoff to Alice Lake around 9am. As a lot of people were waiting for the van shuttle to take them the less than 1km to the start/finish, we opted to just hike in. We’d done a solid round of cleaning out at home and in Squamish, so our pre-race potty needs were minimal and bib/swag pick up was quick. Note though, between my 2011 series running and Connie and I both doing Alice Lake this year, we now have three spiffy black and orange 5 Peaks day bags. We met up with several running peeps, pre-race, including Karl, Greg, Rob and Steve. It was nice to meet Rob’s wife Christine and to see Steve’s wife Leah, again. I also ran into old ultimate teammate Francine, and we had a nice catch-up chat before the run. While you’ll see a couple photos of other people sprinkled below, none were captured of me, and I’m fine with that. I really hate having my picture taken. In addition to the aforementioned overshirting issue, the only other thing I played with was doing the run sans-hand bottle. I used one for Golden Ears and, comparing the two events, I think I’ll stick with carrying one. Even though the events are fairly short and one doesn’t need a lot of fluid or fuel during it, I got one tiny cup of water on the whole course. 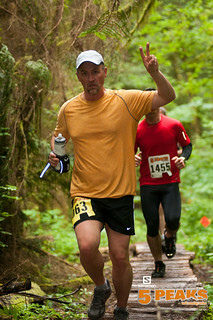 As the water station was a little too early for my liking, I didn’t get to take my gel at all. I wanted the gel for a little kick going up the heavier climbing in the second half of the run and a hand bottle would have allowed this. I also just like being able to get a little extra sugar and hydration when I want while running, so I’ll stick to running with one for the other three 5 Peaks events this year and any other trail events I may do. The course is a lot different than Golden Ears and, even though there’s (officially and by Garmin standards) less elevation gain and the course is 2.5-3km shorter, it feels a little tougher to me. This may be because the climbing happens a little later in the race and goes from quite steep to fairly steep/rolling and lasts longer. 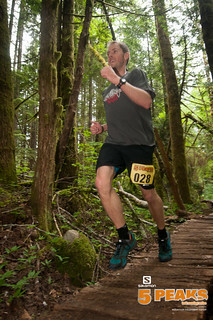 Whatever the reason, my pace per km was 10 seconds slower than Golden Ears, but I placed better overall and in my AG. The early part of the course rolls a fair bit, while gaining about 100 meters with a really nice combo of single track and wider straight gravel trail over the first half of the course. Lots of fun, and while there was a sprinkle now and then, the forecast rain never materialized. Between 5 and 6k, the course hits a solid 250 meter elevation drop over the next 2km or so. I didn’t bomb down this all that much, as it’s sprinkled with a lot of fun switchbacks, so I was being somewhat cautious picking my lines. Particularly since I was a little more aggressive than I should’ve been on the downhills at Golden Ears and nearly face-planted at least three times, I didn’t want a repeat. I’m happy to say I never even came close to a wipeout or fall all day at Alice Lake (I guess you could take that to mean I wasn’t pushing hard enough). “6 seconds? I thought you had me! !” Steve’s response on Twitter, though he began about 2 seconds ahead of me and finished about 10 seconds ahead of me, after I’d been 20 feet ahead of him in the middle of the race. We ran within probably 30 feet of each other the whole way. Somewhere a little past 7k, the course goes back up and regains the 250 meter drop, but does so over less distance and is quite steep at times. Unsurprisingly, it was this stretch where I lost some time (more so than I would have expected), particularly as in the second part of this climb, my back and calves got a little tight on me and needed a bit of stretching. At roughly the 9k mark, we got spit out to a wide gravelly/bouldery 100 meter drop over less than half a kilometer. After grinding to a slow hike in the previous 2k, once my hips and legs adjusted to heading back downhill, I was as aggressive as I could be on this section and hit a 3:51 split on this km of the race. The final sprint to finish is pancake flat and rounds the east side of Alice Lake. I’m not looking for huge gains race to race this year, but just some slow progress back to paces I’m happy with. On pure pace, I wouldn’t say this was much of a step forward, but the only real gauge I can use is placement. 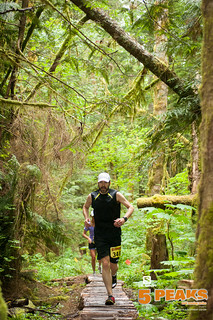 At Golden Ears, I was 68/158 overall and 18/30 in my AG, while Alice Lake saw me place 71/221 overall and 14/35 in my AG. These aren’t exactly scary numbers, but placing well in the top 1/3 overall and getting close to top 1/3 in my AG means I made some strides since Golden Ears. 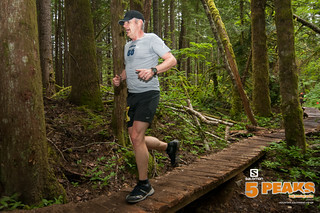 The ‘Silver Fox’ Greg Burnham is pictured to the left, while 9th men’s overall finisher, Karl Woll and Rob Kirkpatrick are left and right respectively, below. I waited for a short time for Connie to come in. I know she had a good time on the sport course . We chatted with the running peeps for a few minutes, but were cooling off rapidly and grabbed the shuttle to the truck quite quickly after Connie finished. We tried to meeting up with Steve and Leah for coffee, but ended up going to the two different Starbucks’ locations in Squamish and never quite got it together. A venti long Americano and breakfast panini later and we were off to Vancouver. I’d decided I wanted closer to 20k for the day, so I banged off another easy, flat 7+km in the afternoon at home for 18 on the day – easy being a relative term. There are two possible events over the next two weeks that I may consider. 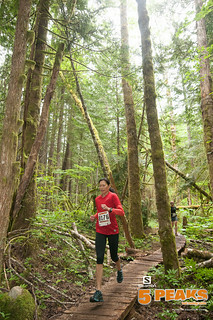 I’m unsure if I want to do the Longest Day 5 or 10k this coming Friday, since I haven’t got a lot of speed on my legs yet, but I’m seriously considering the Scotiabank Half on June 23 (or maybe even another jaunt up the Sea-to-Sky to do the 25k Comfortably Numb trail race) to see if there’s been any improvement since the BMO Half in early May. Of course I can just settle in and get six weeks of solid training done while I ramp up my cycling distances, waiting until the next 5 Peaks run at Cypress, though I’m sure something will look appealing in early July even if I don’t do another race in June.